Last week, we told you a little bit about one of the treasures in our home town of Muskegon Michigan the USS Silversides! That’s not the only historic maritime attraction here! We’d like to introduce you to the LST 393 as well. 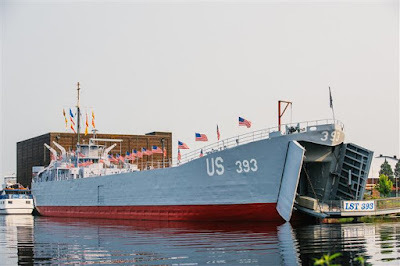 The LST 393 is moored in Downtown Muskegon and serves as another tribute to our “greatest generation”. She served in WWII in the European theater and is credited with 30 round trips to Omaha Beach on D-Day. Once her time in Europe was completed, she was heading for Japan via the Panama Canal when the war ended in September of 1945. She is only one of two LST Class ships left in its original configuration… one of two out of 1050 ships like her built. Needless to say, she’s a treasure. You can click on the picture for their website! Today, the LST 393 serves as a museum, and has been painstakingly restored to her grey paint scheme. She had been camouflaged for the trip to Japan when the war ended. You will find a lot of interesting artifacts, events in and on top of the ship and walking her decks you can see what the crew saw day in and day out on board. A few years ago, I took my dad on a walk thru of it as he served on an LST class that had been modified into a repair ship for the Vietnam War. It was a great honor to see that ship through his eyes. He remembered every door and here it led. Like the USS Sliversides, I did a video about the LST a few years back. If you’d like a short tour. Have a look.